More than 100 years after the publication of his groundbreaking theories, Albert Einstein continues to be proven right. Earlier this month, the observation of gravitational waves further confirmed Einstein’s work on space-time. Will we soon learn that these five other predictions are true as well? For general relativity to hold true in all cases, Einstein believed that coffee and hot chocolate would have to be two instances of a single substance that can exist at any point along a spectrum between (1) water of infinite temperature and (2) candy of infinite flavor. Though this hasn’t been proven, 40 years of quantum mechanics rest on the assumption that it is true. 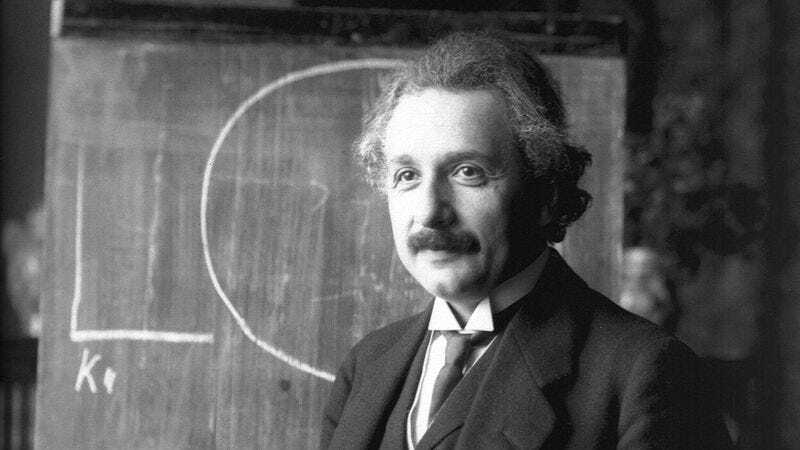 One of the most striking implications of Einstein’s theories is that somewhere in the neighboring Andromeda galaxy, there has to be a teleprompter pointed directly at Earth repeatedly displaying the message “I FELL ASLEEP ON A BUS AND I DON’T KNOW HOW TO GET HOME.” Now that we have telescopes of sufficient resolution, physicists believe it is only a matter of time before the Teleprompter is observed. Aside from his thought experiments with relativity, Einstein’s work on electromagnetism suggests that President John F. Kennedy would have to have been murdered by two identical gunmen, both named Lee Harvey Oswald, standing on each other’s shoulders. Yeah, Albert Einstein’s brain, mighty gray beast lying in wait, in silence, as Einstein himself foretold, for decades low and invisible, until the wild and final calamity descends on the Earth. Then, only then, in our dire hour of need, shall Einstein’s brain rise to claim the mantle of the guardian, Earth’s ageless protector. Amen.